Here comes the jet gunner back in action with the all-old exclusive black color Tom Cruise Top Gun jacket. This heavy-duty bomber jacket is tremendously tamed with real leather and flawlessly backed up with a premium viscose lining towards its interior. It seems that the Top Gun super-hit flick’s never going to end. The military emblem impressions are embedded quite exquisitely to this first-rate Air Force fabric to let it stand up to become one of the prestigious warring wardrobe additions. The collar-cuff stature is carefully collaborated with a rib-knit finesse to let you readily pursue the dead-on effect of the tactical Tomy fighter spirit. Overall, a fine fashion flair to let you emphasize your bold and daring identity elements. 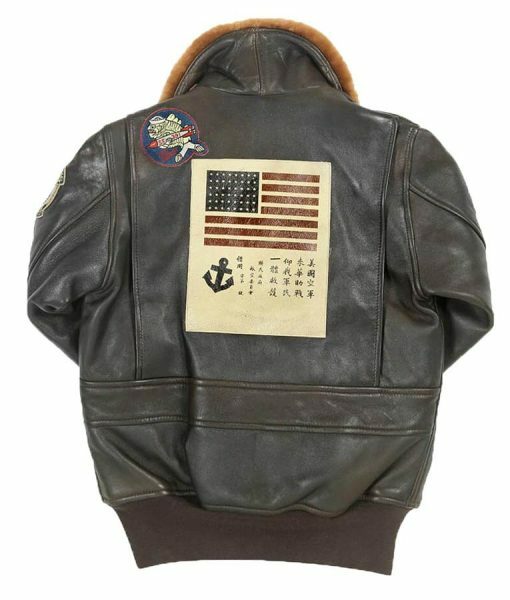 So go on and try your Top Gun Leather Jacket with all the patches on it. This is a perfect Bomber Style jacket for the price. You have to keep two things in your mind while purchasing. They have clearly described the jacket so when you buy you should keep in mind what you’re getting and what not. 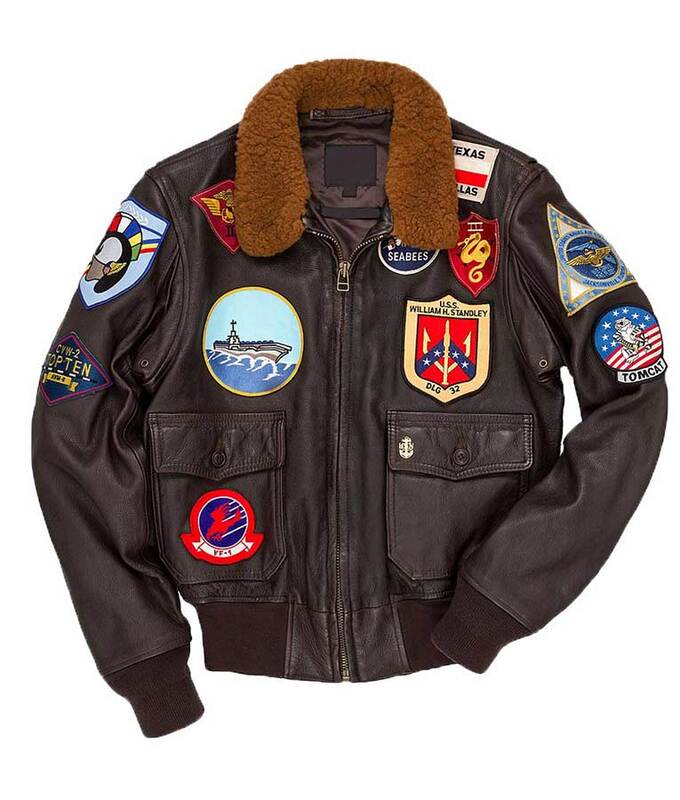 The Bomber Jacket or Flight Jacket was first introduced in America that was in early 1930’s. It was a jacket for pilots with distinctive features and was best for those who got for them. However, if you go for the original bomber jacket today it will easily cost you $1000. This jacket is not an authentic A2 Bomber Jacket but it’s more accurate as the Tom Cruise Top Gun jacket. Like the single piece leather back that gives comfort and durability. This jacket is designed in three piece leather back but that’s nothing wrong. It’s the latest style of Bomber Flight Jacket. It’s goat skin leather that was genuinely used in the making of Flight Jacket. It’s has tight cut across the shoulder and waist. In the latest bomber jacket, there are no dual pockets in this jacket that are commonly known as hand warmer pockets. I had mine for a month now and it still smells like new leather. There is no crease on it, the color didn’t fade, and not a single thread is coming out so far even from the patches and it all shows the quality of it. 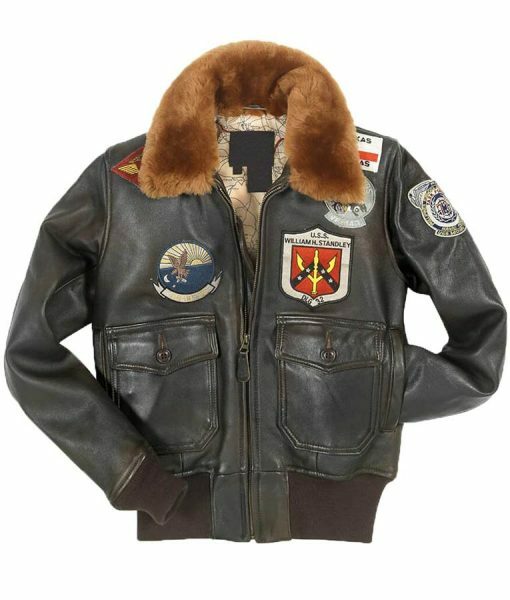 If you go and have a look around, you will find an authentic genuine detailed Bomber Jacket for $100 to $500 more. But this one here deserves to be purchased. This jacket is enough to keep you warm below 32 degree easily. I recommend you to go for this coat and get a typical looking bomber jacket that can please you with its look. The jacket is amazing itself! It was nicely packed when I received it. The quality was exceptional to believe and was perfect for the price. I have worn it in winters mostly and will looking to use it in future. Love the cozy warm feel wearing this coat. This is a nice jacket. Please read this comment before purchasing. This is a genuine leather jacket and it’s natural that it smells that can disturb you for a while. This smell is due to the tanning process and a person who usually wears leather jackets (like me) will never have objections with it. What is preferable is that to hang the jacket outside of your window for a day or more till the smell runs out. This is the best and easiest way to remove the smell. And never put perfume on the outer of coat, this will ruin your jacket completely. Always use it on inside lining. 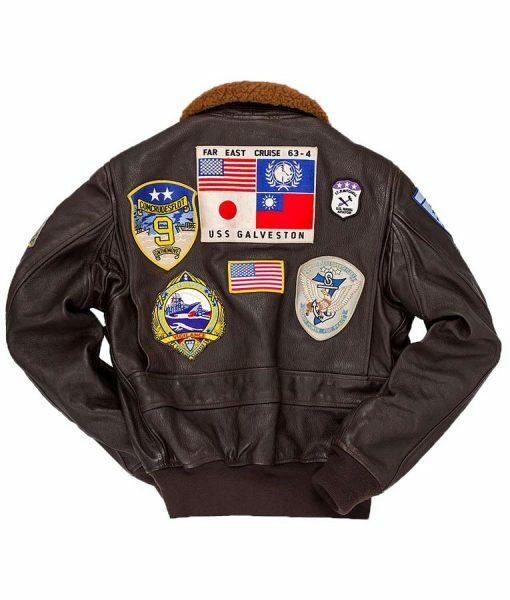 This Top Gun jacket carries all the accurate patches and the genuine flight jacket style. You must get one for you. In general, I am overwhelmed by the nature of the material particularly the logos on this Top Gun Cruise rendition. 1. This doesn’t fit like a normal jacket, however senses more like a biker’s coat. 2. This is somewhat close-fitting on shoulders/trunk and underarms – in the event that you close the zip as far as possible up, it is too tight on your neck also. Would propose the manufacturer to take a shot at the fitting to determine the over two issues. Over all, not a bad outfit at all. I ordered myself this Tom Cruise top gun jacket and made a few amendments with the team working here. I feel quite sad that I didn’t received as I ordered it too.. Though I am satisfied with the leather material and how the specifications turned out. Less Emblem imprints. Not much condensed stitching leading to a more malleable jacket wear experience. Zipper cuffs instead of rib-knit. You were about to score a 5 star review but your carelessness brought you to a 3 star one. Answered by the admin	You will get the exact same jacket as displayed over here with all the same patches. You can contact our sales department for pictures of the finished product.